Korea 10 years usage machine of Blowtech. Overhaul in Blowtech, USD40,000 only, then start the other 10 years life, it is a service from BLOWTECH. 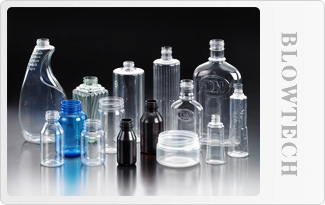 In reply to rapid increasing demands of PET bottle in the markets Blowplas Technology Co Ltd has put 20 years’ experience and utmost efforts in developing latest technology and providing reliable servicing. 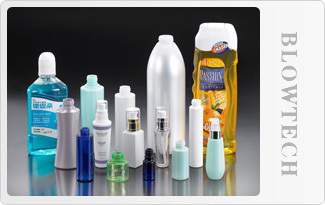 Applicable products: cosmetics, pharmaceuticals, infusion bottles, detergent, mouth wash, baby feeding bottles, spice, salad dressing, food, liquor, PET Can, industrial containers Thanks to the restless efforts of the staff and personnel , Materials : PET PET-G PLA PEN PP PP-SU TRITAN PC. Blowplas is now in a position to provide customers throughout the world with the products highly competitive in performance quality and price and the global distribution and services network. From machine, molds to final product, Blowplas is the right partner you can trust and rely on. Model BT-S is equipped with 2-station servo table and side-blow system. After injection the servo table rotates 180 degrees, a servo screw then transfers a neck plate with preforms to the side-blow station. Using side-blow system a bigger work space is available, and optional devices: gate trimmer and product conveyor etc can easily be mounted inside the machine. This model is good for small containers with short cycle time. Model BT-J, has the same benefits, but is for wide-mouth jar applications, and it's a stronger machine with higher injection clamping force. In comparison to 3-station (AOKI) and 4-station (Nissei ASB) designs a 2-station machine, that needs less neck cavities and has a more effective mold width, bringing cost savings. Mold costs are an important issue in running diversified and low volume products lines. The tooling/mold cost in our simple and innovative system is the lowest of all. A full mold set includes following parts. Simple mechanical structure for dependable long term use. Minimized mold parts leading to more economic tooling costs. Multi-national patented process suitable for most thermoplastic applications. Fully computerized touch screen provides user friendly operation interface. In-mold preconditioning, no extra heaters required. Standard air/hydraulic parts are widely available. Providing know-how and services from mold designs to final products. Please contact us if you have further questions, we are always glad to speak with you.